A glorious fall day yesterday. Sunny, warm, beautiful. It is a challenge to believe that nighttime temperatures are going to soon drop into the 30's. Some vegetables do not mind the cold and can be grown and eaten all winter. Others will turn to slime when the temperature dips. Tomatoes, squash, peppers and eggplants all prefer the heat of summer. There are plenty of green tomatoes. 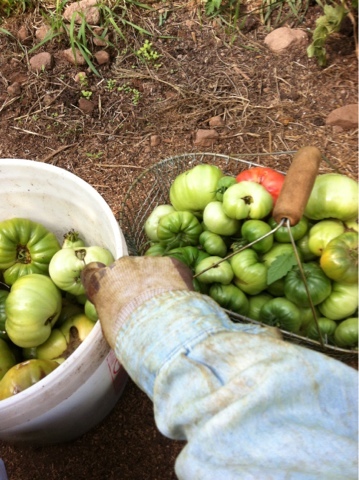 It is easy to feed the full green tomato plant to the big pigs, and to get the tomatoes for fried green tomatoes or for a cooked sauce to go over meats. Or to roast them. Our open pollinated tomatoes produce tons and tons of pollen. Enough pollen to turn sleeves, gloves, hats and pants green. The tomato plants have a very particular scent, one that says summertime and good eats to me. We are busy pulling tomatoes for us to eat and tomato plants for the pigs to eat before the plants and fruit become frozen, rotten and develop an entirely different odor. These are green days of a different sort. Green everywhere, and it stains. Will stain skin if allowed to make contact. When washed, using all of the phosphate free detergent, presoak and direct sprays we have...the clothes stay green. The stains don't come out. The formulations in laundry products that are environmentally friendly are no match for our green jeans.